Sign up for the Buca di Beppo eclub and receive an offer for a free pasta on your next visit. Choose from spaghetti marinara, fettuccine alfredo, or baked ziti! 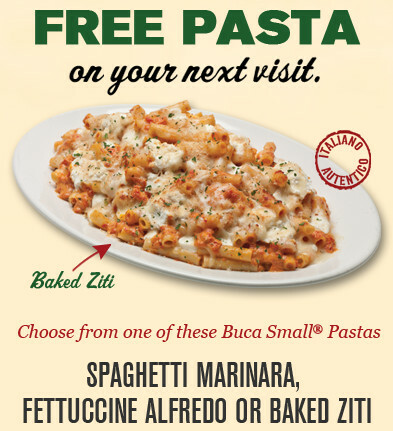 To get this deal, visit bucadibeppo.com and sign up for an Eclub then you can have your Free Small Buca Pasta of your choice. Buca di Beppo is known to be a chain of friendly neighborhood restaurants that has a lively atmosphere with authentic Italian menu for everyone to enjoy. Their dishes are meant to be shared as well as served family-style in the spirit of Italian culture. Delicious dishes are enjoyed for generations in the villages throughout Italy inspire their menu, perfect for passing around the table and giving Buca its authentic Italian fare. They continue to innovate as well as create recipes beyond their traditional style by adding new menu items inspired by Northern including the Southern Italian cuisine.